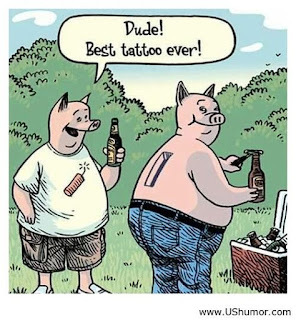 WARNING: This is a preview of Tattoo:The Game Of Ink. All components and rules are prototype and subject to change. In Tattoo: The Game Of Ink players earn reputation points by buying and playing tattoo Design cards onto their arm boards, the player with the most reputation points by the end of the game wins! To begin players take one Arm Board and place it in front of them. Then shuffle the Design and Cash cards separately and place each deck face down in the center of play along with the reputation tokens. Finally two Design cards per player are drawn from the Design deck and placed face up in the center of play to create the Design Catalog. Deal Cash Cards. The dealer deals four Cash cards to each player. These cards are used for buying Designs and to Laser Off old Designs. Money comes in $100 and $200 denominations. Laser Off Designs. Players now have the opportunity to remove Designs from their board. This cost $200 per Design which is paid from the player's hand of Cash cards. Both the Cash and the Design cards are discarded. A player may Laser Off as many Designs as they have cash to do. Purchase Designs. Starting with the player to the dealer's left players can purchase a Design cards from the Design Catalog and place it into their hand. Designs can be paid for with Cash cards and reputation points. The only catch here is that you have to use at least $100 cash. For example a player chooses a $400 design which she pays $100 in cash and $300 in reputation points (each reputation point being worth $100). Players continue to buy Designs until they run out of cash or pass. If the Design Catalog gets down to one card that card is discarded and two new Design cards per player is drawn and placed face up to create a new Design Catalog. Determine Style. Once players have finished buying Designs all extra Cash cards are discarded and the dealer takes the next face down Cash card and turns it over. On the card is a Style (Bold, Fine, Monotone, Multi-color, Flat, or Shaded) which becomes the bonus style for the round. We will come back to this in the scoring explanation. If a Design card is played next to an existing Design card with a matching theme it is awarded one bonus point per adjacent matching card. It also receives a one bonus point per card for Design cards adjacent to those that have matching themes. See picture of winning board below. If a Design card is played that matches the Style which was determined in the previous step (see I told you I would come back to this) it earns one bonus point. Finally if a card is played into a x2 space the point value is doubled. This includes all other bonuses the placement would normally receive. So the order you place Designs in matters. Pass the role of Dealer clockwise and start a new round. Once points are tallied the round ends and new cash cards are dealt out. The game ends at the end of the round that the Design deck is emptied. At that point the player with the most reputation points wins! Winner winner the board on the far side wins! Set up for Tattoo: The Game Of Ink is really fast as you are only dealing with some player boards, two decks and some tokens. Clean up is just as easy and quick especially if you have nice baggies for everything to go in. Although the rules are prototype they are clean and easy to understand and learn. The only thing I would like to see in the final version are some example images and a good scoring example (with all the bonuses in effect). Tattooing is a fresh new theme, one I have never come across before and I am happy to see it. At it's core Tattoo: The Game Of Ink is a set collecting game with elements of hand management and tile laying. What I really like here is the puzzliness (pretty sure I just made up a word - call Webster) of the game. Trying to figure our how to make chains of like themes while setting myself up to score the most points each round is awesome. Game play is quick regardless of the number of players. It does take a little longer with four players verse two but it isn't a huge gap. I found that most games lasted between 25-45 minutes which falls within the recommended time. The game also plays well with all ages. Although my kids didn't get to play this one I could easily see my 7 & 9 year-olds picking this one up pretty easily. And for the most part the card art wouldn't stop that from happening (thank you Copper Frog Games and Nolan Nasser). There is player interaction as everyone is buying Design cards from the same pool of cards. Players can easily have a card bought right out from under them before their turn comes around. This really adds to the game as you may have to change your strategy midstream. The cover artwork is AMAZING!!! I really wish that it would have carried over more to the Design card art. While there are many cards with beautiful artwork on them there are also cards that look like clip art images. I am hoping these are just place holders (this has been confirmed that some of the art is indeed place holders). Again this is a prototype so the components are not final. That being said the components as is are solid (another winner from the Game Crafter). My favorite aspect of Tattoo: The Game Of Ink is the puzzle solving. Trying to figure out what to buy and where it will go makes for great game play. Not to mention being able to Laser Off designs and trying to figure out how that will come into play. Tons of decisions to be made (and that makes for a good game). The next aspect I am excited about is seeing a new theme emerge. I am not sure it will catch on like Pirates or Zombies, but I could see some solid titles coming from this. Finally some of the artwork is just amazing and really keeps your interest as the game progresses and you are watching these tattoos spread across your arm (board). One thing I am concerned about is the re-play-ability, only having a small board with a very set configuration may disinterest players over the long haul. Something that could easily be done is adding more body part boards (keeping it clean) with new configurations. Bonus cards could also be implemented to give individuals secret goals to complete throughout the game and for end game reputation. 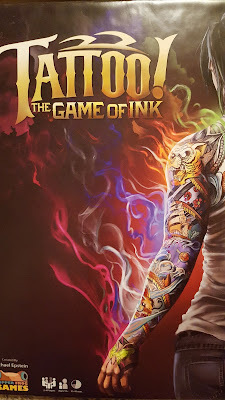 Tattoo: The Game Of Ink is a very interesting game, I found myself surprised I liked it as much as I did. The set collection, tile laying, puzzle solving mechanics all work really well together here. All-in-all this is a really cool game that is solid. Set collecting games like Ticket to Ride and tile laying games like Carcassonne will love Tattoo: The Game Of Ink. I am giving Tattoo: The Game Of Ink 7 out of 10 super meeples.